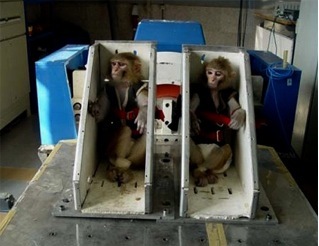 Iranian Rhesus monkeys in containers of type used for failed space launch. Iran’s unsuccessful attempt to launch a Rhesus monkey into space last month merits more mention than it has received in the press thus far, because of what it implies for U.S. nonproliferation objectives. The failure provides two timely reminders: 1) a long-range missile threat from Iran is not imminent; and 2) Iran’s quest for space-faring nation status is encumbered by the international sanctions that have been imposed due to Tehran’s unwillingness to abide by its safeguards obligations to the International Atomic Energy Agency (IAEA). As with the “non-barking dog” in the Sherlock Holmes short story, it is important to observe what has not been happening in Iran’s missile program. One must acknowledge, however, that space rocket programs also warrant concern because they too involve development of technology relevant to long-range ballistic missile systems. The U.S. Intelligence Community warned in its 1999 NIE on the foreign ballistic missile threat that space launch vehicle development can mask military missile programs. Although conversion from space launch vehicle to military missile system is not as trivial as is often implied, it is true that much missile technology is transferable from peaceful to military uses. It is therefore necessary, in assessing the threat posed by Iran’s ballistic missiles, to evaluate parallel space program developments as well. In spite of Tehran’s promotional efforts and extravagant claims, Iran’s space program is in its infancy. U.S. press and politicians are often too quick to accept Iranian propaganda as reality. For example, Iran’s February 2010 display of the Simorgh, a space-launch vehicle (SLV) with a first-stage cluster of four No Dong class missiles, was heralded at the time as a “nascent ICBM” and has served since as a stand-in for Iran’s long-range missile potential. Yet the public had only been shown a mock-up, which, if constructed as a military system, would have a relatively small payload and no mobility. Iran’s September 2011 launch failure followed two earlier successes this year: a sub-orbital flight in March 2011, carrying a biological payload with a mouse, two turtles and worms; and the launch into low-Earth orbit in June of a small surveillance satellite, a payload insufficient for a long-range missile warhead. But the Simorgh has not been flight-tested – if indeed it has even been built – and none of the other rockets launched have range/payload characteristics demonstrating ICBM potential. The evidence to date thus argues strongly against those who foresee Iran soon developing a longer-range missile for nuclear warhead delivery — especially considering the historical experience of other countries in developing long-range missiles and in pursuing parallel efforts to launch satellites into space. 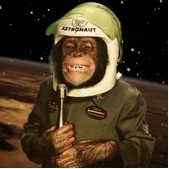 President Mahmoud Ahmadinejad had announced in February 2011 that the launch “of a large animal” into space would be the first step towards sending a man into space by 2020. The Iranian Space Agency later explained that the planned launch of a bio-capsule containing a live monkey by the domestically produced Kavoshgar-5 rocket would provide Iran “essential know-how in developing life support systems in space as well as detection and recovery mechanisms.” On October 12, Iran’s Deputy Science Minister publicly acknowledged the launch failure in the previous month, but did not provide details or attribute the cause. There is precedent, of course, for space launch disasters in the U.S. and Soviet experience. The human toll of twenty-four astronauts and eight cosmonauts was preceded by the death of animals in space. The first animal to orbit Earth, “Laika,” the Soviet space dog, died of overheating and stress a few hours into the flight of Sputnik 2 in 1957. Although America’s most famous non-human space-traveler, “Ham,” the chimpanzee, survived his suborbital flight in 1961 with only a bruised nose, one of his simian predecessors was not so fortunate. In an eerie foreshadowing of Iran’s recent experience, a Rhesus monkey suffocated in a capsule on top of a V-2 rocket during a U.S. sub-orbital flight in 1948. Such things happen in the early years of a space program and Iran’s effort is in the “early years” by any measure. What is not comparable in the U.S. and Soviet experiences is the extent of obstacles Iran must surmount in trying to acquire or develop the necessary technology and experience to make progress. Although Iran has benefited from global technological advances, acquisitions of foreign missiles, and past assistance from foreign scientists, it must still overcome many technical obstacles to develop longer range missiles. In spite of its oil wealth, Iran does not have the large pool of rocket scientists the Soviet Union could draw on for the space race of the 1950s and 1960s, and Tehran cannot marshal the resources available to the vast Soviet empire during the Cold War. Unless Iran can get out from under the international restrictions imposed on space program efforts because of their potential contribution to nuclear weapons delivery vehicle development, the prognosis of Iran’s space program is not good. Unlike other spacefaring nations, Iran faces an international community, which has officially banned its space launch attempts and is committed to blocking the transfer to Iran of missile technology items listed in the MTCR Annex. UN and unilateral sanctions thus pose a double burden for Iran: Not only are the opportunities for a “masked” military effort minimized; the opportunities for displaying the technological prowess and prestige of the Islamic Republic are also crimped. Unless Iran shows willingness to fulfill its nuclear safeguards obligations to the IAEA, its race to space is likely to be a discouraging slog. [1.] Ahmadinejad’s 9-year timeline for first sounding rocket launch of bio-capsules to first crewed space flight would represent a shorter interval than achieved by the Soviet Union (10 years), the United States (13 years), or China (39 years). This entry was posted in Iran, Middle East, Regions and tagged Iran Space Launch Vehicle, Iranian Space Agency, Rumsfeld Commission. Bookmark the permalink. Greg, re. your statement “Tehran’s unwillingness to abide by its safeguards obligations to the International Atomic Energy Agency (IAEA)” could be taken out of context.